A proudly Igbo writer who describes herself as taking the steps of legendary novelist, Chinua Achebe. 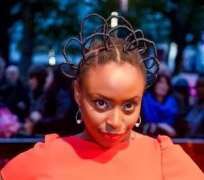 Chimamanda Adichie is very creative and definitely lives what she believes. Her hairstyle (as pictured above) to the premiere of the film written by her entitled, Half of a Yellow Sun, depicts depicts an unrepentant classical writer who is poised to take creativity to the next level. It is the so-called outdated thread stretching hairstyle that originated from West Africa, called African Threading. Will anyone say she cannot afford any design of hair extension? How many girls of this jet age will agree to wear this in public?